Java: How to change font of JLabel? In my last post I have discussed about JTextField Validation process. 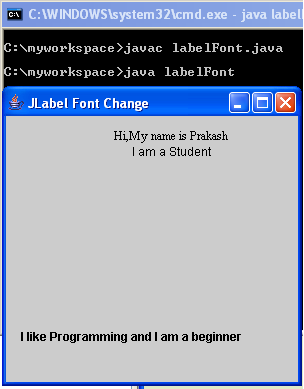 Today I want to share my idea about how to change the font of JLabel in java. Sometime in java programming we may need to change the font of JLabel. Actually, it depends on the developer and may be for the outlookings of the software. So, whatever the reason is, there is a way to change the font of JLabel in java. In the given example, I have just tried to give an idea about how to declare JLabel in java and also how to change the font and font appearance of the following JLabel. *** Important Note: Whatever the font you want to apply in your JLabel, it must be installed on that computer.